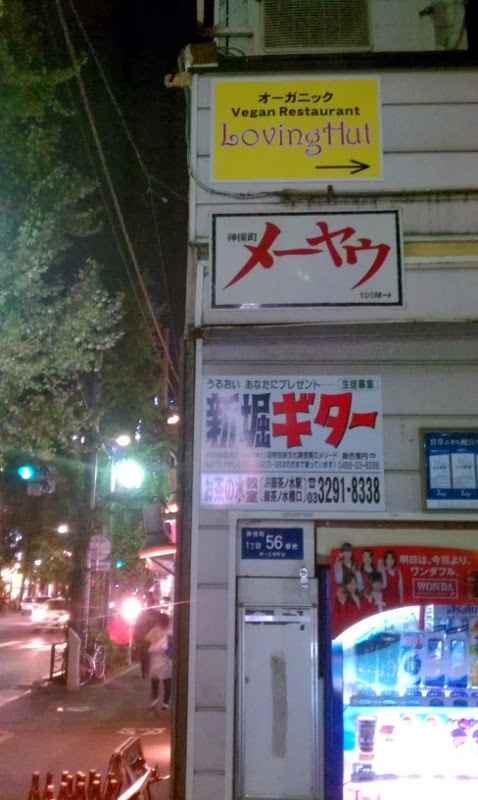 Japan's only Loving Hut has been around for several years, but recently moved from Shinjuku to Jimbocho. While down a small alley and not in a prominent location one would easily stumble upon, it's only a few minutes walk from Jimbocho Station and is well worth the short trip from central Tokyo to visit it. The new location has a larger interior than the old one, but is an equally pleasant place to dine and relax, out of the hustle and bustle of Tokyo. The new Jimbocho Location is more spacious, with about half a dozen tables. The new location serves an expanded version of its older menu, and some new favourites, such as Ma Po Tofu and enormous fried dumplings (known as gyoza in Japanese). These fried dumplings are the largest I've ever seen. I should have photographed them with something else in the picture for comparison. They also produce their own ginger ale, which can be served hot or with cold mineral water. 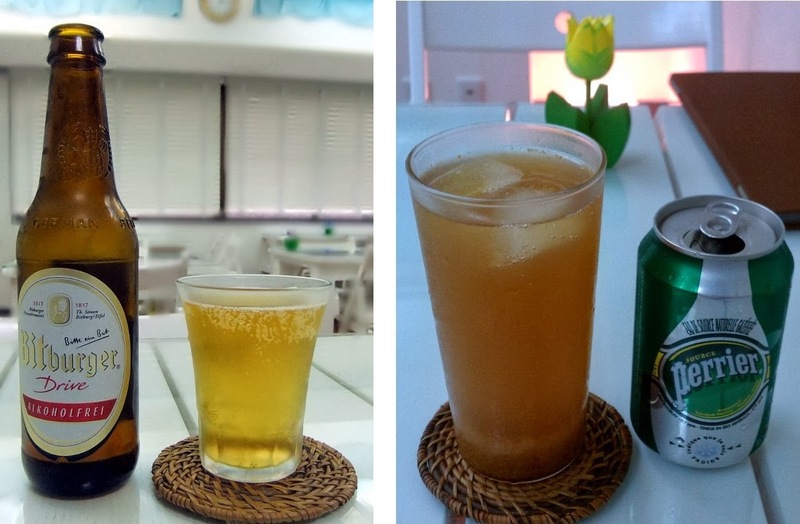 Non-alcoholic beer is also served. Perhaps the most significant addition to the Loving Hut is the new all-you-can-eat Dim Sum buffet. While there's nothing misleading in the name, as the menu includes many Hong Kong style favourites, anyone who's familiar with Taiwan will recognise the buffet as a typical (but very good) Taiwanese buffet, with many of the traditional Taiwanese favourites. There are a variety of different plates and dipping bowls available, for a more Japanese dim sum experience. But excited by the huge variety I dropped back into my Taiwan ways, loading up one large plate. The Taiwanese tea is a nice addition to the meal. All are cooked to perfection, and the busy staff never seem to stop bringing out fresh plates of delicious dishes. Round two didn't look so good (because of how I arranged it on my plate), but I needed to try some of the dishes I didn't the first time. The buffet is now served for dinner on Friday (2000 Yen) and lunch on Saturday (1200 Yen). Many of the dishes can be enjoyed as part of the dim sum set for weekday lunches, which is also an excellent meal at only 1000 Yen. The Loving Hut has also opened a cooking workshop during weekday evenings (except Friday) and Friday lunchtime. I hope to try it in the near future, and will update when I do. The shop also sells frozen mock meats (imported from Taiwan) for 630 Yen, so it's worth stocking up if you like them. Most mock meats made in Japan contain dairy products and/or egg, so this is the place for trustworthy fake meats if you like them. 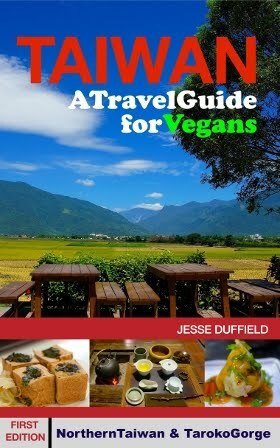 They also sell vegan-related and spiritual books and related items. 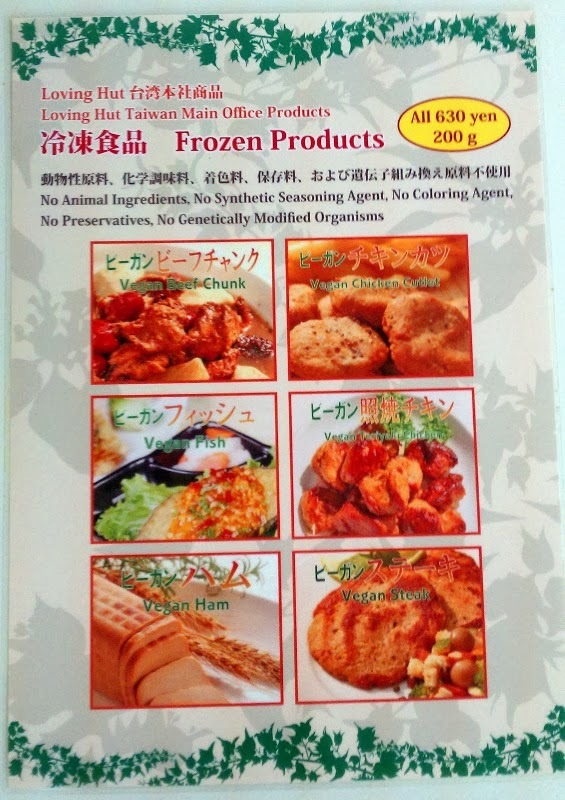 These fake meats are the best deal I know of in Taiwan, and being produced by the Loving Hut company, one can be sure they are vegan. The Loving Hut also sells boxed lunches from 11:30 - 14:00. At 600 Yen, these are an excellent option for a cheap, healthy, delicious vegan meal on the go. I remember several years ago taking two lunchboxes with me when I climbed Mt Fuji, and eating them cold on the mountain the next day. They weren't ideal in the circumstances, but provided me with much-needed energy before the climb ahead. 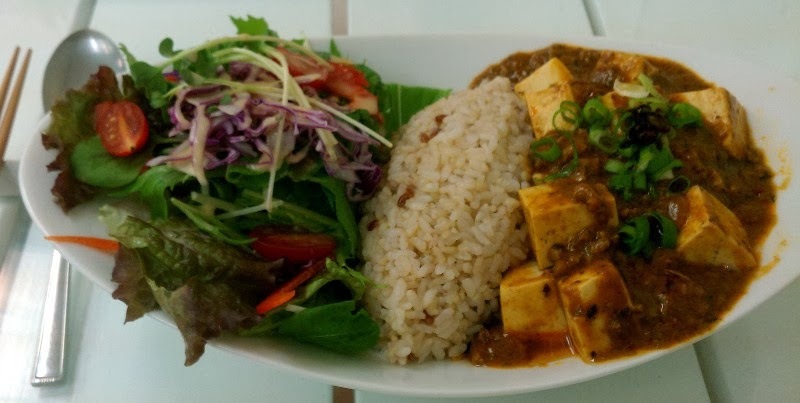 The Loving Hut often hold a staff selling vegan food at festivals, such as Earth Day and of course the Tokyo Veg Festa (vegetarian festival) in October, Japan's largest vegetarian event. Their booth always seem to have a long cue, and run out of main dishes early. During these times the main store closes, check their website for any announcements of closures or changes to opening hours. a Loving Hut stall at the (otherwise disappointing) Eco Life Fair, 2013. 2014 Update: The Loving Hut now list their opening times on this Google Calendar, so please check it before going. The Loving Hut is closed on Sunday. Cooking workshops are now available by arrangement. The Loving Hut also does catering for parties and other group functions - details all at their website. Go to Jimbocho Station and take Exit A5. Walk around the corner so you are heading north. Walk north about 250m until you see a small yellow Loving Hut sign. Take that alley, and the Loving Hut is on the second floor of a small building on the right, about 50m down the alley. As of October 2014 this map is not working, probably due to the creation of the new Google Map Engines. 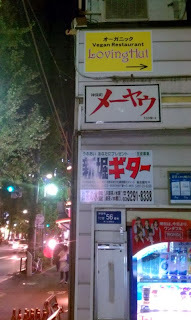 Please click on the link and it will bring up a map with correct walking directions (300 metres) from Jimbocho Station. As of April 2014 this dish no longer appears to be on the menu. The 'Loving Burger' has been a staple of the Tokyo Loving Hut for years, and is typical of Loving Hut food worldwide: simple, healthy, appealing to non-vegans and very well priced at around 1000 Yen. Maybe discontinued as of April 2014. Thank you for visiting Loving Hut Tokyo. We now serve lunch on fridays too!